My work is evolving - moving toward a stronger, more dynamic approach to each piece. My aim is to enhance my subject using a critical eye, depicting its intricate beauty using both vibrant colours and muted tones, to ensure full tonal contrast is achieved. Having booked to attend a three day course with Helen (I had seen her articles in Leisure Painter) I was very apprehensive, I had dabbled with watercolours for a while but I had never attempted anything like botanical painting. I need not have worried, the three days were a very great pleasure, Helen immediately put me at my ease and I felt very welcome. I worked hard in her pleasant studio but enjoyed my ‘down’ time too with a light, tasty lunch each day. Helen tailored her teaching to my ability whilst encouraging me to learn: I did not feel pressured and whilst I was in awe of her talent I did not feel discouraged, I felt rather that she wanted to share her learning and enthusiasm with me. I came home tired but enthused and very glad that I had made the effort to step out of my comfort zone…. I found that I really enjoyed the discipline of botanical art and have continued with it since coming home. I find water-colour the most challenging of mediums and despite various unsatisfactory attempts, it was not until I did a day-school with Helen that her method and clear teaching gave me the results that I was hoping to achieve. Working on a different paper with a different brush and with a less wet method, I found I had more control of the paint. Her calm way of taking her students step-by-step through the stages encouraged and built our confidence. I was once told "your art will find you" and certainly I have found "my" style which I know innately is right for me. A well paced interactive and professionally delivered course. Clearly expressed and demonstrated. Good tips and skills communicated, and good company! I have taken two courses with Helen, a day course, and a three day course. For the day course I painted an apple, it was my first real introduction to botanical painting, but I was able to produce a painting that I was proud of. For me Helen’s teaching was ideal, pushing me through the pain barrier and fear factor of actually getting paint on paper. The three day course was more involved (painting a lily) Helen was very adaptable in gearing her teaching to my specific requirements. Although there are a few courses around, I really think there is nothing to beat the one to one teaching that Helen gives. I find that now when I am working on my own, I am remembering all the little tips and tricks! all the invaluable info about colour and composition, perhaps most importantly Helens encouragement. I now have the confidence to believe I can be a good botanical painter. Having never done any flower or botanical work previously, I was somewhat nervous prior to attending my one-on-one course. I need not have worried – it was great fun and I had a really enjoyable day. Helen’s warmth and relaxed style of teaching really helped me to relax into the painting and she is more than happy to help with any aspects you need repeating for clarity. Helen is extremely knowledgeable and approachable (apart from being a really lovely lady!) and she was more than happy to share her many talents with a novice like me. I would highly recommend a short course with Helen as a real tonic and who knows, it could develop your passion for botanical art. The only downside was when the day ended!! Helen's work was beautiful. I included her paintings in a book I made for my husband and they brought the whole project alive. Helen was a joy to work with and her pieces were delicate, vibrant and gorgeous. Having seen a brilliant article about Helen Campbell and her art in a magazine, we were very fortunate to be able to do an art class with her. The class at Castle House was of varying standards but everyone was very happy with how Helen made each one feel at ease. At the end of the day there were some significant paintings and everyone said they had learnt a great deal. We very much hope to work with Helen again. Thank you so much for doing such a fantastic job on our new logo. We wanted something that was unique and you have certainly achieved that for us. The quality is absolutely stunning - we love it! We have been trying to capture visuals for our perry pears so that we have a good reference to turn to in the future. 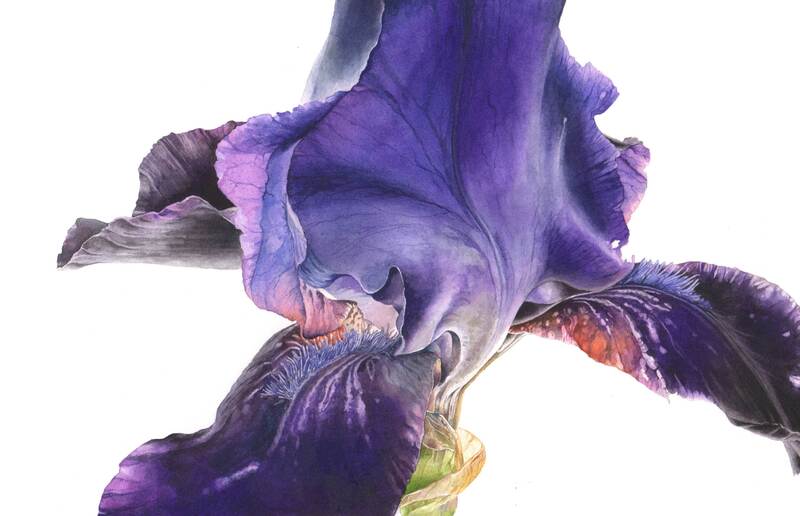 Helen Campbell's work is truly exquisite and her eye for detail catches everything. After I had booked a day's tuition with Helen I looked forward to the day with considerable trepidation, but under her expert tutelage I completed a picture of a Dahlia which I am thrilled with. I would most definitely recommend Helen's tutelage for anyone wanting to learn to paint botanicals, and I will be returning for further lessons in the future.